William Shankly was a Scottish football player and manager, who is best known for his time as manager of Liverpool. 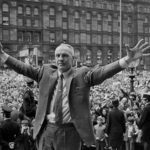 Shankly came from a small Scottish mining community and was one of five brothers who played football professionally. He played as a ball-winning right-half and was capped twelve times for Scotland, including seven wartime internationals. He spent one season at Carlisle United before spending the rest of his career at Preston North End, with whom he won the FA Cup in 1938. "Some people think football is a matter of life and death. I assure you, it’s much more serious than that." "Football (soccer) is a matter of life and death, except more important."